October's almost over, but as with every year, it's still Breast Cancer Awareness month, and you can take part in it with the polishes you purchase. Almost every single polish brand out there is doing something, but here's 2 that I've personally learned about: Morgan Taylor and China Glaze. Morgan Taylor's a fabulous line of beautiful colors, especially this Breast Cancer Awareness trio, called Fight Like A Lady. The brand Always took the negativity out of the phrase "like a girl", and now Morgan Taylor's mirroring that sentiment by donating a portion of the proceeds from this trio to Susan G. Komen Foundation. I combined the trio into this nail art for the campaign, Fight Like A Lady. Take a look at the shades on their own after the jump, plus some China Glaze shades! Lip Service (2 coats) - A dusty yet bright pink. If it makes sense, it's a chalky color without a chalky consistency or texture. Applied like a dream. P.S. I Love You (2 coats) - This is a pale lavender, with a bit of a thinness, but still a great application. It's stunning! Fight Like A Lady (3 coats) - The namesake of the collection, Fight Like A Lady is a glitter bomb in a barely there pink base. 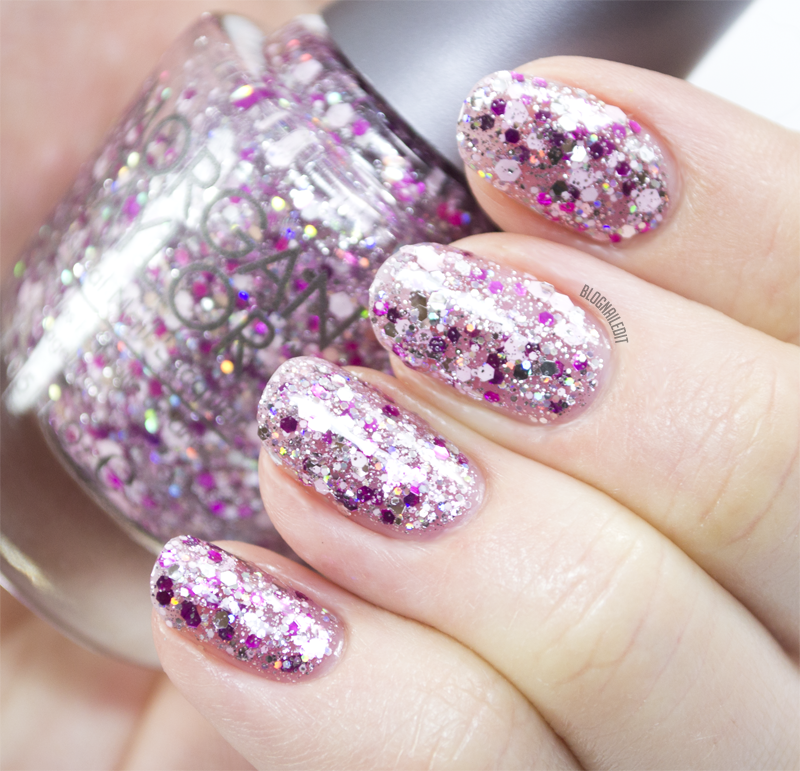 The glitter includes magenta chrome, matte baby pink, silver holographic hexagonal and tiny bits of silver holographic. Visit loxabeauty.com (redirected directly to from Morgan Taylor) to pick up Fight Like A Lady. This month, China Glaze honors the strength of all women affected by breast cancer with the new Celebrate Courage collection. Inspired by the women who gracefully fight everyday and those that support them in their battle, the six-piece collection features three new matte crèmes and re-promotes of three classic bright pink shades. 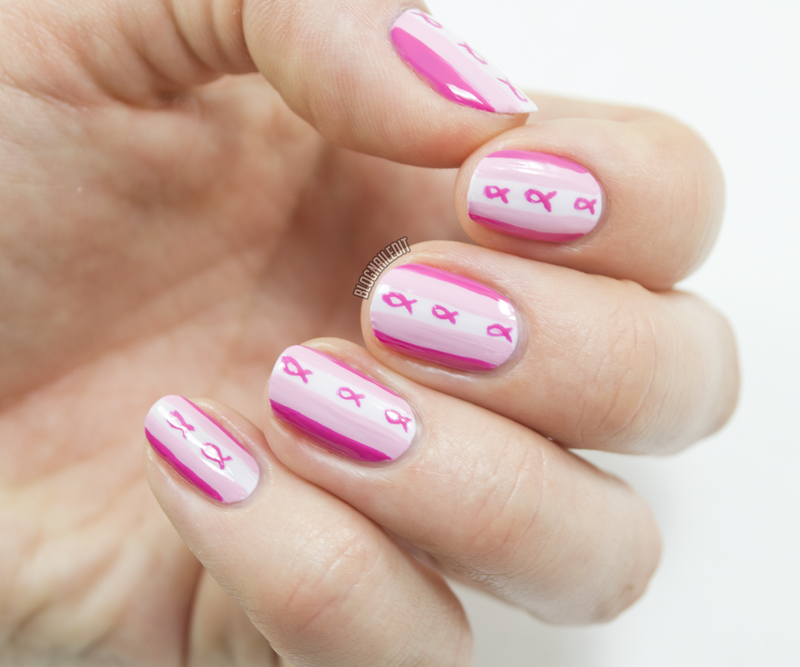 I've combined them into a simple Breast Cancer Awareness themed nail art. Here's the re-promoted shades you're probably already familiar with. Make An Entrance (2 coats) - A creamy light and bright magenta. Apologies for the blurry shot. Rich & Famous (3 coats) - This crelly-like shade is just a beautiful bright pink. Awesome shade! Strawberry Fields (2 coats) - A hot magenta jelly with an obvious gold shimmer. And here's the brand new matte shades! Loveable as they are, they're damn hard to work with. I was glad I had the new large 0.5 fl oz bottle of Matte Magic to top them with, evening them out a bit. That top coat, previously only available in 0.325 fl oz, will be out for grabs in 2015. Carpe Diem (3 coats) - A barely there white-pink. A stun-ner for pedicures, I just wish the consistency was easier. It's streaky and may drive unfamiliar polishers up a wall. Sheer Bliss (3 coats) - Off-white putty matte with a teeny bit of irridescence. Life is Beautiful (3 coats) - Baby pink matte. You can see a little bit of the uneven streakiness with this shot. Visit China Glaze to pick up this collection. 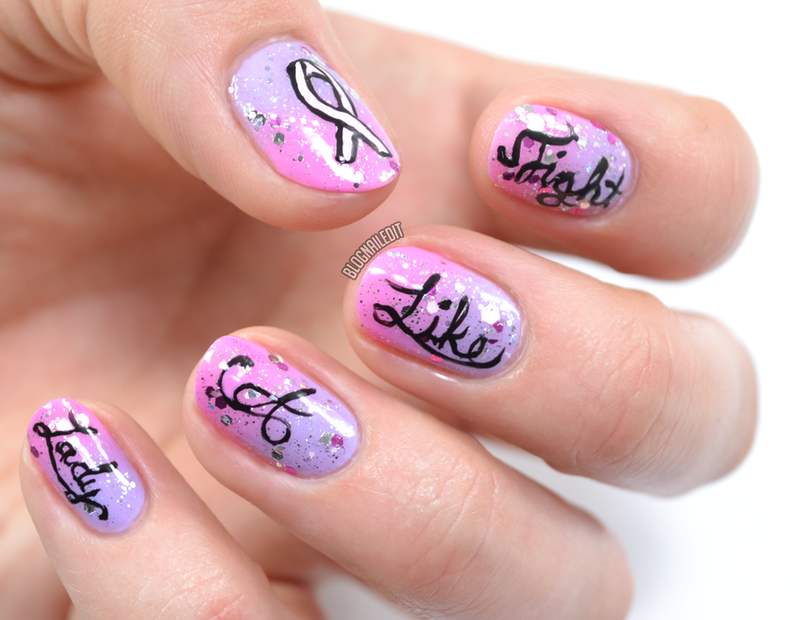 All the pink polishes are lovely and the nail art is perfect for this cause!